I was hoping for some Demon love this expansion. This is the link card we have been waiting for. Now the imp summoning spells make a lot of sense. They are still kinda slow though. Big help for the imp deck. Very strong. Decent card, probably will be a 1 off in token demon zoolock decks. Arcane Explosion plus half a Branching Paths +1 attack for demons, not bad for zoo decks. This is a sick card in general but it's a great reason to be playing a bunch of imps. Absolutely no downside. This has to be one of the oddest effect pairings ever. An aoe attached to such a specific buff, lol. This card isn't that great because you need such specific conditions to get full value out of it. You need a board of demons AND the enemy having multiple minions susceptible to your AOE. Most of the time it will just be an overpriced Arcane Explosion or a significantly worse Blessing of the Ancients. Probably needs to cost 2 to be effective. Arcane Explosion is weak and the effect is specific and weak, so it'd still be fair. 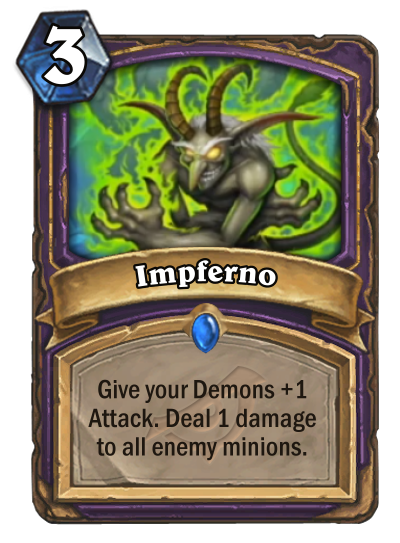 the card art for Doubling Imp and Imperfno both 3 mana cards is too similiar, I keep mistakenly casting the wrong one.